The other day, Father's day, to be exact, my family and I set out to celebrate what should be considered a stunning achievement: I have been a father for over 2 years and my kids are (1) still alive, (2) have all their limbs, and (3) have not spent any time in jail. It's really more than I could ask for and brings tears to my eyes. Besides getting eight pairs of socks to commemorate the occasion, I got to pick a breakfast celebration location. That's how we found ourselves pulling up to a strip mall on 2925 W. 38th Ave just East of Federal. 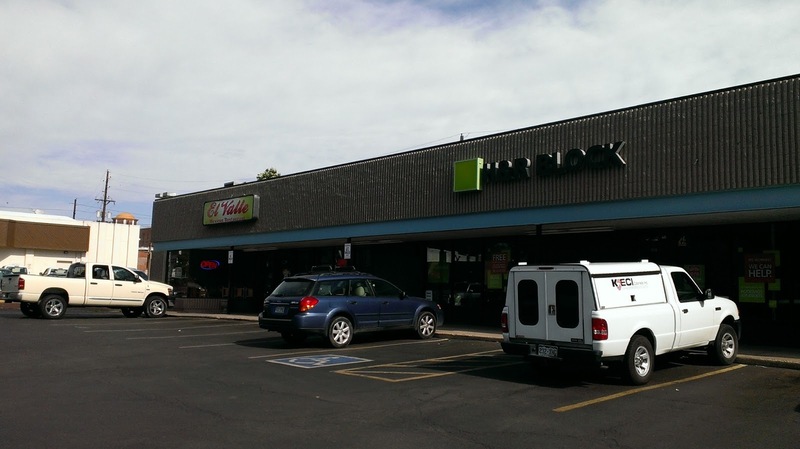 I've written before about the strip malls of Denver, and how they hide some of the city's finest gems. I used to get surprised by this but I realize now, after 12 years in this town, that is just the way it is out West. Of course some of our city's finest eats are in the ugliest of strip malls: South Federal and basically all of Aurora are essentially one big strip mall. But I digress. It wasn't just that there was a good restaurant in this Sunnyside strip mall, it was also a telling representation of what this part of Denver is becoming. 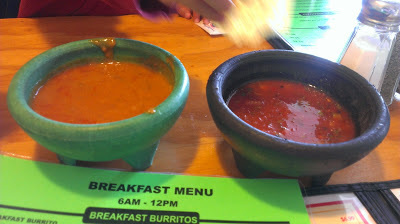 On one end was our destination: El Valle Mexican Restaurant, and on the other a hip, line-out-the-door brunch spot. The parking lot, too, showed the diversifying diversity (that is, the gentrification) with Subarus on one end and big pick-ups on the other. 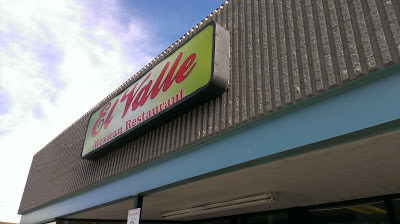 The sad difference was, there was no line out the door at El Valle; in fact it was empty. We walked in anyway and were greeted by a remarkably cheery server who sat us in one of the rigid wooden booths facing the street--or, um, the parking lot. We were served a still-hot basket of chips with a bowl of fresh-though-mild red salsa with big chunks of cilantro alongside a bowl of steaming pinto bean dip. The bean dip became quite the focus of attention in our 4-top, as my Mexican wife who claims to hate beans, went on and on about how much she loved this particular cup of beans; while I pointed out that every time she reminds us how much she doesn't like beans, it is while stuffing beans in her mouth. In the meantime, our boys, who really do love beans and would readily admit it, had eaten more than half the bowl. It really was good, and it is always a good sign when food that restaurants give away for free has been carefully prepared. We ordered from the diverse breakfast menu; diverse, that is in the sense that they had both kinds of Mexican food: the Colorado green chile kind and the kind you find more of below our nation's border. We were inspired by the former, and ordered up some wonderfully sounding cultural blends of which, of course, there are infinite possibilities. I had a smothered burrito filled with machaca. Smothered means lathered with green chile of course, and this was the gravy-like Colorado kind, and packed a nice spicy kick. Machaca usually means dried beef, and is common in Northern Mexico, but this was more like shredded beef. 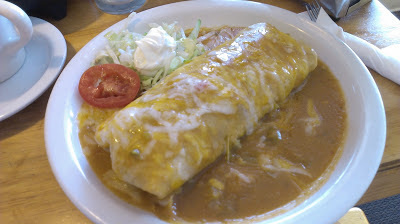 It also had eggs, potatoes and all the other breakfast burrito fixings wrapped up in a giant flour tortilla. It was nothing less than excellent. My wife had what I believe was called something like a Mexican breakfast skillet. 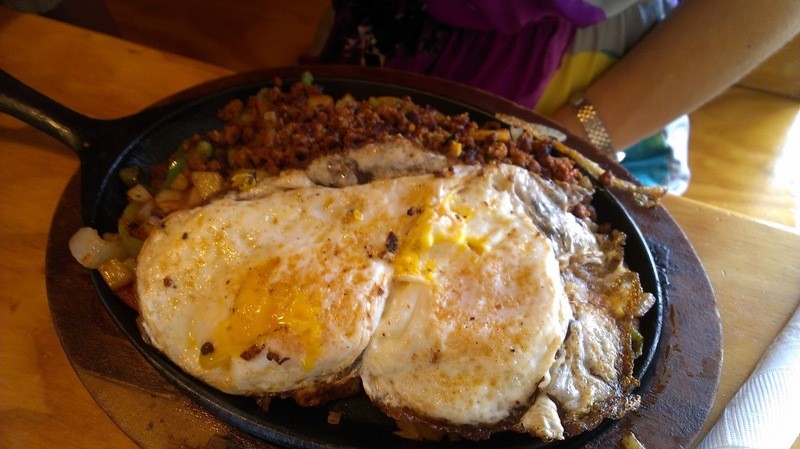 This sounds like something you might get at the Village Inn, but apart from the expected sizzling oval-shaped cast iron plate, this was a much more flavorful meal than could be had at any run-of-the-mill breakfast stop. 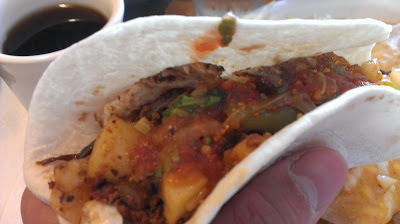 The fresh chunks of chorizo, grilled onions, peppers, and potatoes made for a great breakfast taco with the accompanying tortillas. And my wife did her own smothering, you guessed it, with those lovely beans. Gentrification is what it is, and will always happen in every city, but a neighborhood like Sunnyside is a special place, and I hope that it can find some balance like is found in this strip mall, although it would be nice to see a few more Subarus in front of El Valle. If not, the fate of El Valle might go the way of so many other restaurants in nearby hoods-- in fact El Valle was displaced from nearby LoHi not too long ago. If it were to altogether disappear, regardless of what the ethnic makeup of the neighborhood ends up being in the next five or ten years, that would be a shame. I love little hole in the walls - what a great find! Growing up in LA, I've yet to find mexican like they make it back home, but I am hopeful! I'll have to try this place out! I have found surprisingly little talk on the internet about the taco and gordita truck across the street from El Valle in the Carquest parking lot, Marisela's. Next time you are in that part of town, stop by. The desebrada tacos are worth the drive across town.